8 Jan 2000, around noon. Highpoint #3. 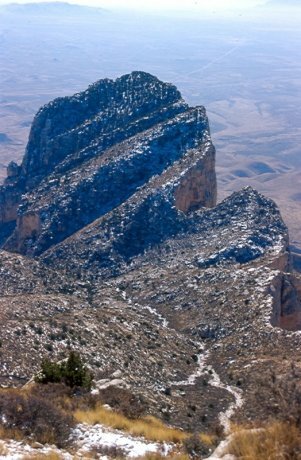 Guadalupe Peak looming through the clouds, from low on the trail. 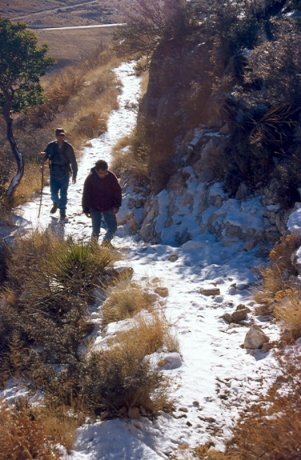 The trails were entirely snow covered, not a common sight in Texas! 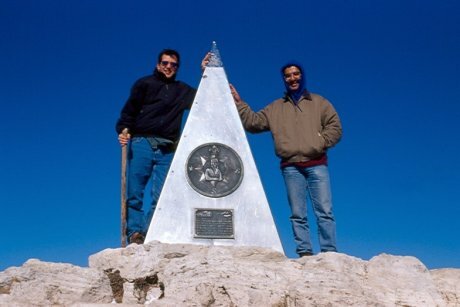 Eric (left) and Mehdi (right) on the summit. 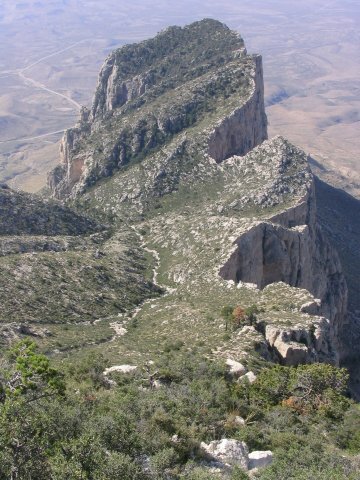 El Capitan, seen from the summit. 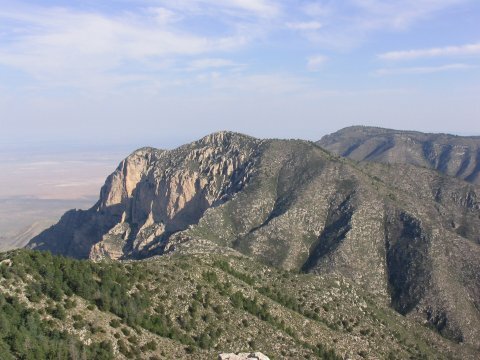 El Cap is the lowest of the eight 8000 foot Texas peaks. 20 Apr 2005, late morning. 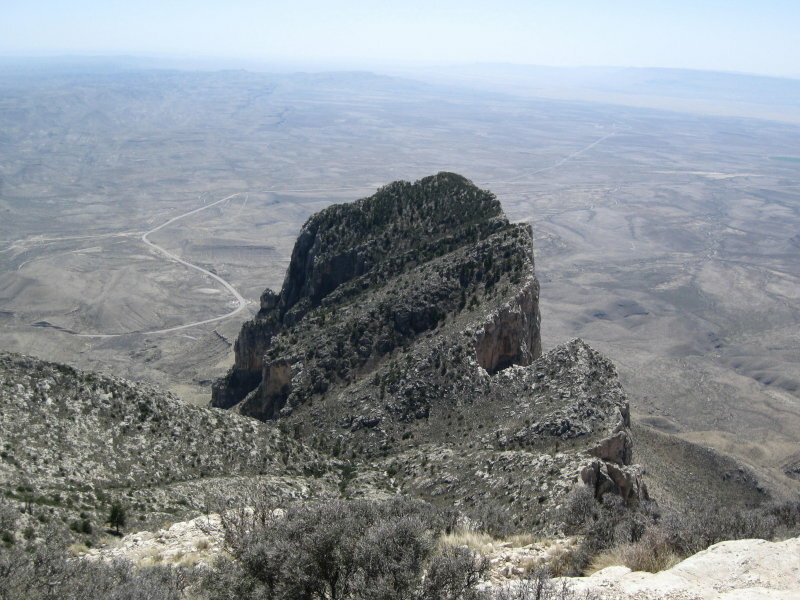 After a few days of hiking in West Texas, I made a return visit to Guadalupe Peak. The weather was nice - when the sun really hit you, it was warm, but when the breeze picked up, especially on the summit, it felt cool. "Hot and cold at the same time" was one description, which seems apt. About two miles up the trail, I heard a sound up in front of me, and stopped to investigate. 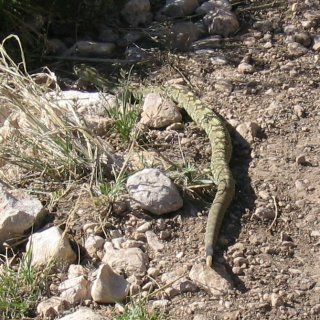 A green rattlesnake was on the trail, eight feet in front of me, it had just given me one shake of its rattle to warn me. After a moment, it politely moved off into the brush, letting me pass by. I found out later, that the hiker in front of me had accidentally peed on this snake! He was relieving himself on the trail, and suddenly noticed a snake in the brush... Oops!!! My advice: Don't pee on the rattlesnakes. 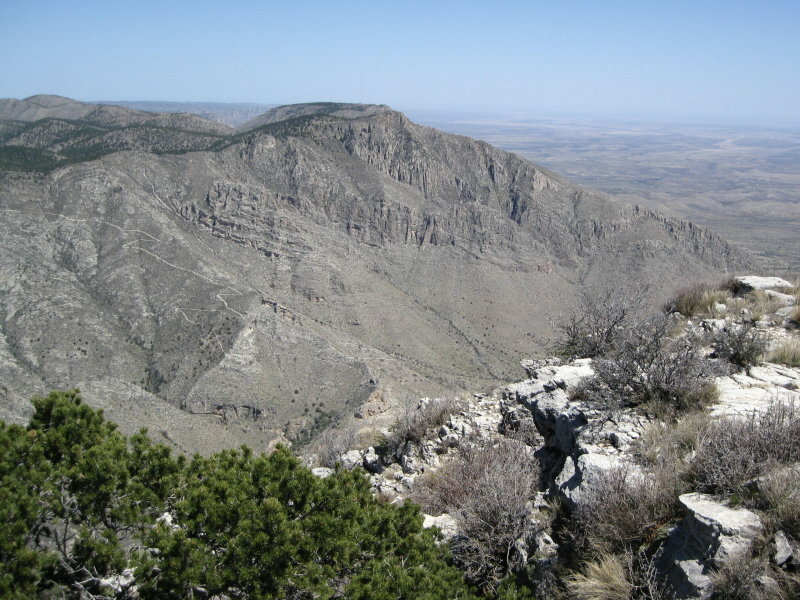 Blacktail rattlesnake on the trail to Guadalupe Peak. 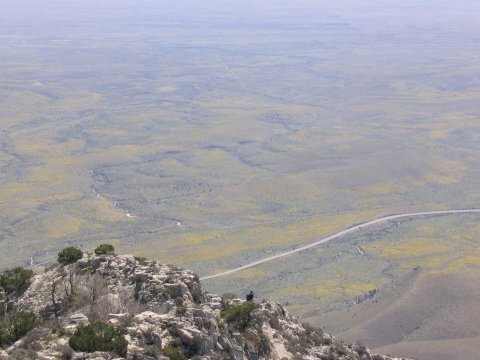 The plain below had lots of yellow wildflowers, which made a nice backdrop. Unfortunately, there was enough pollution to make the view a little hazy. 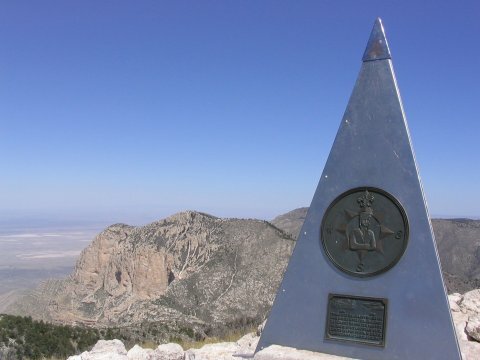 The summit marker, with Shumard Peak to the left. 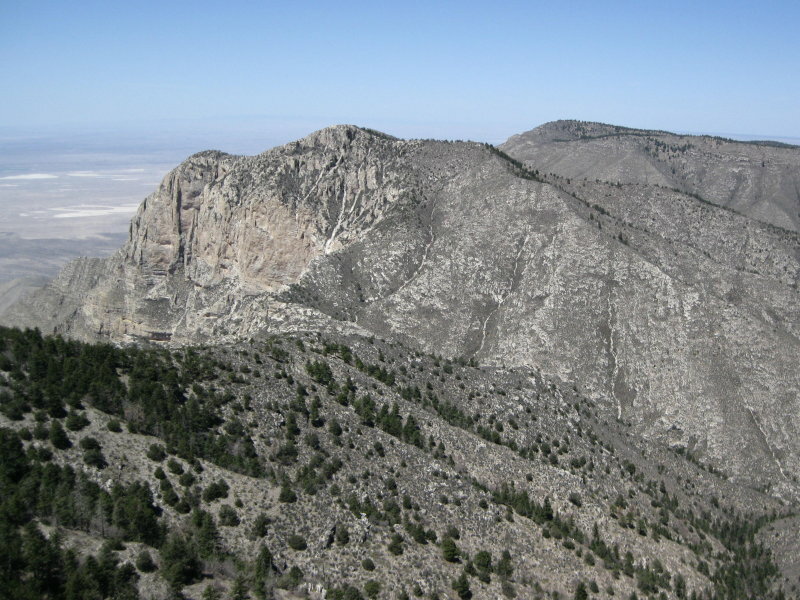 Guadalupe Peak (right) and El Capitan (left), from the summit of Hunter Peak on 18 Apr. 17 July 2005, 8:30 am. 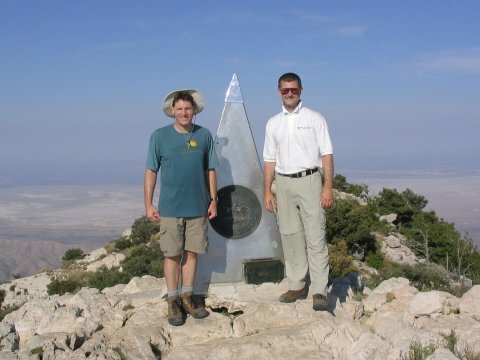 On the way west, towards Whitney, Tom Buckley and I stopped at Guadalupe Peak. Although I had been here before, Tom had not so I needed to tag this one again. 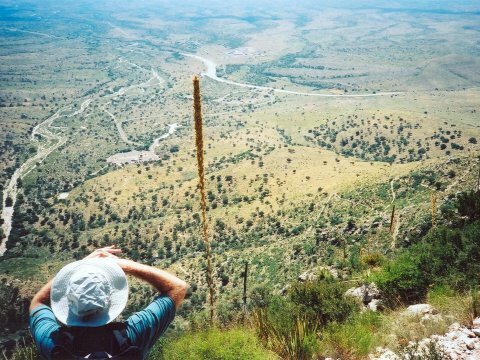 I feared that July desert heat was going to make this hike very unpleasant. However, we made an early start. After a 4 am wakeup in Carlsbad NM, we were at the trailhead around 5:30. We noted the warnings about wild bees and mountain lions, paid our $6 fee ($3 per person), and started up the trail. 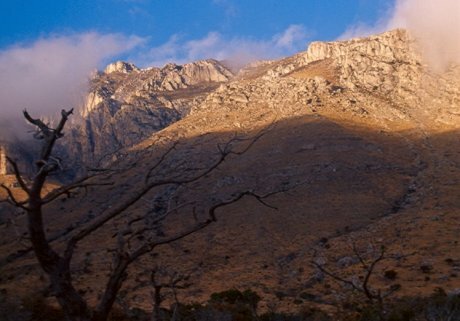 It was still before sunrise, but with just enough light so that we did not need headlamps. At this hour, the temperature wasn't bad at all, pleasant even. By 8:30 we made the summit, and met two people on top. They soon departed, and we had the top to ourselves for around an hour. After some lounging and register reading, we started down the trail, passing several groups on the way back to the car. 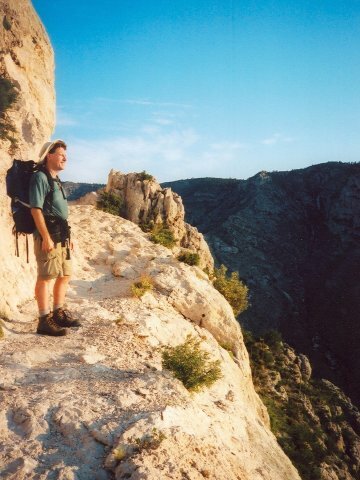 Me checking out the view on the way up the trail. Looking ahead to the summit. Tom and I (r to l) on the summit. El Capitan from the summit. Gazing over the last section of switchbacks on the way down. 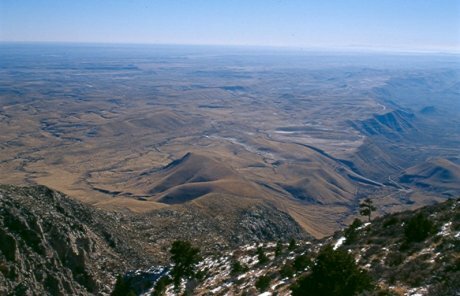 For some physical training in preparation for Mount Rainier, I drove back to Guadalupe Peak to climb it a few more times. After success in claiming one of the few campsites at Pine Springs that has any shade, I added and extra 10 kg or so of water to my pack, and headed up the trail with a reasonably heavy load. 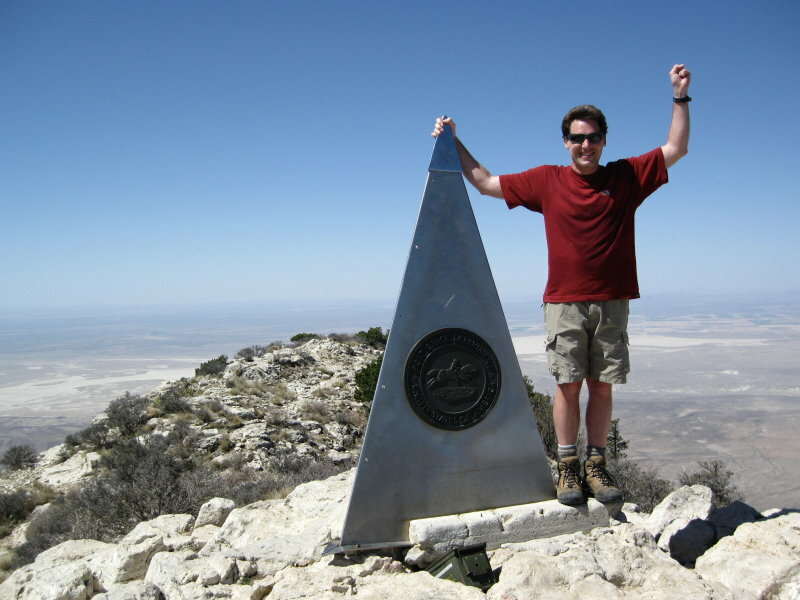 The weather was perfect, and in 3 hours, I earned my fourth summit of this peak. On the top, I met an Australian couple, (one of whom, Andrew Thomas, is a professional photographer), who are trying to visit all of the US National Parks , which I think is a very worthwhile pursuit. 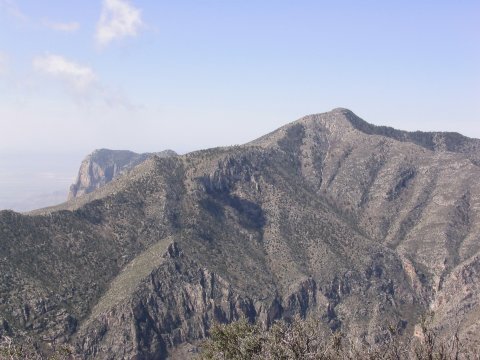 Summit view towards Shumard Peak (8615 ft). 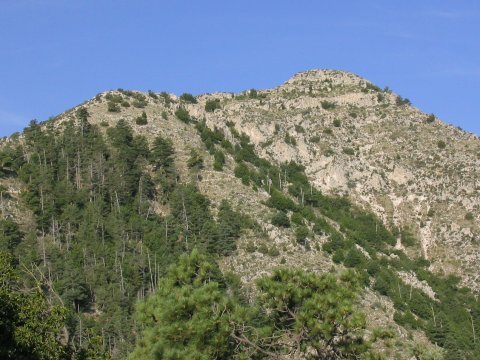 View towards Hunter Peak (8368 ft). 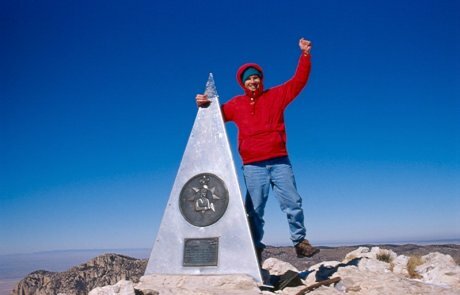 The next day, I headed up the peak again, for summit #5, but this time without the extra weight. Then I drove straight back to Austin, to get ready for a new job.